The nation on Wednesday paid rich tributes to Grandmaster Viswanathan Anand for retaining the World Championship title with Prime Minister Manmohan Singh and Congress President Sonia Gandhi congratulating the chess legend and calling him an "inspiration" to the youth. Congratulating Anand, PM Manmohan Singh said in a message, "You are a great inspiration to the youth of our country, particularly the sports enthusiasts. You have made the nation proud of you with this monumental achievement." The Prime Minister wished Anand many more successes in the future. Sonia Gandhi called Anand's feat "stupendous". "Anand has made India proud. His feat of winning the title consecutively for the fourth time is indeed stupendous," Sonia said in her message. The Indian Grandmaster showed immense resilience to beat challenger Boris Gelfand of Israel in a tense rapid chess tie-breaker to win the World Championship crown for the fifth time and fourth in a row in Moscow on Wednesday. Speaking on Anand's win, Rajendra S Pawar, Chairman, NIIT said, "I heartily congratulate NIIT MindChampion Viswanathan Anand for retaining the World Chess Champion title. 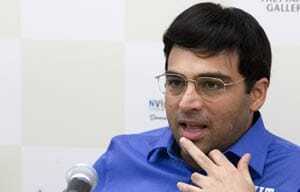 Anand's fifth World Chess Championship win is a new FIDE record and a milestone in the history of Chess." "Anand's fighting spirit, perseverance and determination to overcome any challenge will surely inspire youngsters in India to embrace the game of chess," added Pawar. Anand is a brand ambassador for NIIT.